VR8 Vest Rack™ (Short) Club Vest™ Package includes IRONWEAR’s™ new 8 position storage system and 8 short Club Vests™, IRONWEAR’s™ latest heavy duty weighted vest designed for conditioning, weight loss and sports training. Plus a heavy duty Vest Rack Cover™ to keep your vests protected. Club Vest™ (Short) is IRONWEAR’s™ top of the line 1 to 21 pound adjustable weighted vest (supplied at 11 pounds) designed for maximum performance, high durability, simple operation and easy cleaning. . The unique thin flexible padded shoulder straps keep the Club Vest™ from inhibiting your movement while the flexible design allows the vest to stay in place while still expanding to accommodate your breathing. The chest sizes can be easily adjusted from 24 to over 54 inches. VR8 Vest Rack™ is IRONWEAR’s™ new patented storage system for your weighted vests, extra weights and other weighted gear. VR8 Vest Rack™ was invented for group training of police, firefighters, military, clubs, families and sports teams where multiple weighted vests are utilized. 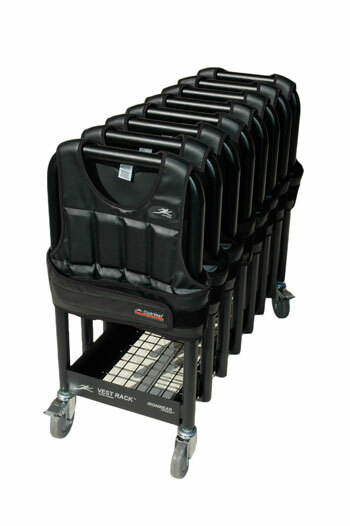 VR8 Vest Rack Cover™ slides over the rack when needed and stores on the shelf inside the rack when it is not. The heavy-duty simulated leather cover helps to keep your weights clean and is water resistant. Club-Vest™ (Short) incorporates all the latest patented IRONWEAR ™ performance features: Ultra thin Contour-fit™ design, soft Flex-metal™ weights, and Double-lock™ belting system. Club-Vest™ (Short) incorporates all the latest patented IRONWEAR ™ durability and comfort features: Soft Club-tech™ inside, Stretch-fit™inner pockets, and Club-leather™outer surface. Club-Vest™ (Short) Contour-fit™ is ultra thin and snug so that the vest will not interfere with any movement of the body. The design incorporates thick stretch padding in the shoulders for maximum flexibility, support and comfort. 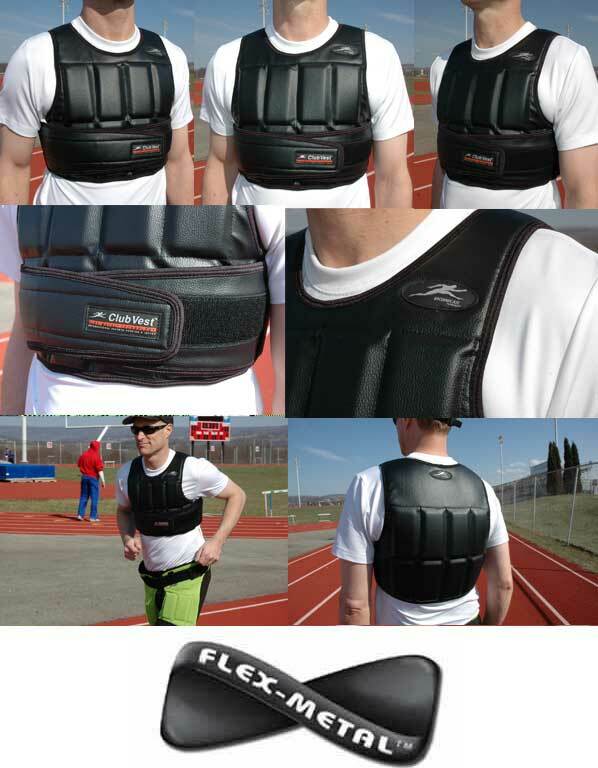 Contour-fit™system allows for a smaller head opening and shoulder straps which make it possible for the arms to raise completely (unlike other vests) so that the vest can be used to play basketball, volleyball and other sports with out interference. It can also be worn easily under clothing. Club-Vest™ (Short) Flex-metal™ weights are the safest, most comfortable and best fitting weights possible. The weights are thin and flexible and contour to the shape of the wearer. The weights act as padding in case of a fall. 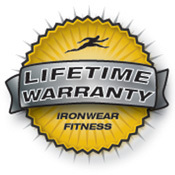 The weights are interchangeable and can be use in a variety of other IRONWEAR™ products. Club-Vest™ (Short) Double-lock™ belting system locks both the end of the belts and the edges of the vest to prevent movement during even the most rigorous exercises, while the oversized overlapping stretch belts holds the vest securely to almost any size torso (from under 24 inches to over 50 inches). The system holds the vest and weights firmly against the body while still allowing the vest to expand to accommodate breathing. Club-Vest™ (Short) Club-tech™ is a patented coated laminate system that provides padding, strength and easy cleaning to the inside of the vest. The Club-tech™ material has a soft glove leather outer surface that does not absorb sweat or odor and feels soft on the skin. Inside there are layers of knitted nylon for strength and a layer of rubber for padding. The outer surface can be wiped clean easily and dries quickly. Club-Vest™ (Short) Stretch-fit™inner pockets hold the weights securely on all sided and keep them from shifting. The inner pocket design makes in impossible for the weights to come loose while you exercise. Stretch-fit™pockets are thin and flexible. The special weight pocket system distributes the weight uniformly over the chest and allows the soft weights to bend and flex with your movements. Because no hardware or Velcro is used to hold the weights in place, the vest is safer, longer lasting, thinner and more flexible. The inner pockets allow the vest to be smooth and uniform in thickness. Club-Vest™ (Short) Club-leather™shell is soft, durable and easy to clean. The simulated leather surface is supported by a strong inner woven structure. Because the surface does not absorb moisture it can easily be wiped clean and disinfected. Since it dries rapidly it is quickly ready for the next user. Club-Vest™ (Short) has 20 weight pockets which into which one or two ½ pound soft Flex-metal™ weights can be inserted. The vest comes with one weight per pocket and the vest shell itself weights just under two pounds. The vest can be adjusted from 1 to 21 pounds. Club-Vest™ (Short) is IRONWEAR’s ™ top of the line weighted vest was designed for use by clubs, schools, teams, police, firefighters and health care providers. The Club-Vest™ (Short) is ideal where there are multiple users and all different levels of physical activity. Club-Vest™ (Short) non-porous design is hotter that the Cool Vest or Speed Vest and is a great way to loose extra weight. Club-Vest™ (Short) is supplied at 11 pounds with a single layer of Flex-metal™ weights, but can be adjusted from about 1 pound up to 21 pounds by adding additional ½ pound Flex-metal™ weights. Club-Vest™ series also includes hand, wrist, and shoe weights. VR8 Vest Rack™ has a steel wire storage shelf with a raised edge to keep items from falling out. You can use the shelf to store all your extra Flex-Metal™ weight inserts or store your Shoe Irons™, Hand Irons™ and /or Ankle Irons™. VR8 Vest Rack™ comes with heavy-duty wheels so you can move your weighted vests easily from place to place. After rolling the rack into position you can lock it in place with the wheel locks. Roll your vests easily from room to room, roll them to the practice field, and roll them into a corner or closet to store them. VR8 Vest Rack™ makes life easier for everyone. Users tend to leave the vests piled up on the floor, creating an immovable mass. With the VR8 Vest Rack™ users can easily slide their vest on and off the rack. This helps to keep the vests and your floors clean. VR8 Vest Rack™ makes it easy to check your inventory and helps to keep vests from disappearing. With a glance you and/or the users can see that all the vests are in place. The user can also quickly pick out the vest they want to use and with the storage shelf, they have somewhere to get or place extra weights. VR8 Vest Rack™ is easier and safer to use. Weighted vests are too heavy for standard clothing hangers, coat hooks and closet rods. Also as the vest weight increases the vest becomes harder to put on a hanger and difficult to lift up high enough to hang on a coat hook or closet rod. VR8 Vest Rack™ makes hanging the weighted vests quick and easy. The low profile design minimizes the lifting required and slide over support tube eliminates the need for hangers completely.